It’s known that most people don’t notice hidden messages in logos and ads. Why do so many of them still include those messages? People get captured by thousands of advertisements when they surf the Internet, watch television, shop in supermarkets and simply walk out of their apartments and stroll along city streets. Businessmen struggle to promote products dragging the whole society into the masses of billboards, hoardings, roadside signs and posters with striking slogans and logos. The more successful your campaign is – the more successfully your business runs. Creating a catchy logo is a real challenge, as a designer has to make it simple, business-related, long-lasting and with appropriate color combinations. The secret of marketing is to invent an absolutely unique unit to represent company’s strengths and specializations. Herry Beckwith (2012) considers marketing to begin with the invisibility and intangibility of services and evaluating user’s needs and drives. Right images are to make people chose you and your business on the intuition and perception levels. Hidden signs are the best assistants in magnetizing audience. They are to reveal the meaning of a logo, but have to be covert for us to read between the lines, use our imagination to disclose designer’s ideas. Simple at first glance, logotypes can be genuinely brilliant. John Maeda (2006) derives the main rule of simplicity – subtract the obvious and add the meaningful. Al Ries and Jack Trout (1981) convince us that the message has to be sharpened to cut into one’s mind. 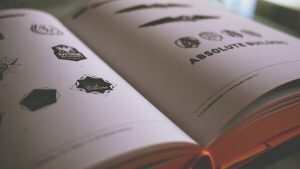 The majority of customers do not pay specific attention to checking company’s logo history and hidden messages, but a wise designer knows lots of tricks how to unconsciously push them deep into our heads. Users may not spot a secret sense straight away, but once they uncover it – be sure to hear: “Check out what I have found”. Meaningful logo builds strong associations to its company, making it recognizable and singled out among the others. Emblems should be not only eye-catching, but mind-catching as well. Ries A., Trout J. (1981). Positioning: The Battle For Your Mind. New York: McGraw-Hill. Presented design paper is provided to give you a good example of how such papers should be written. We remind you that any usage of the text without proper references is prohibited. We know that being a student is hard and draining, so we are always ready to offer you professional help. All you need to do is to fill the order form below and print out your ready paper, we will take care of the everything else! You can be sure that your design paper will be delivered on time, and that it will be done accordingly to all modern academic demands.